On August 13, 1961, the govern­ment of the GDR sealed off the border to West Berlin. A nearly impenetrable border-security system extending 155 km (96 miles) came into existence. 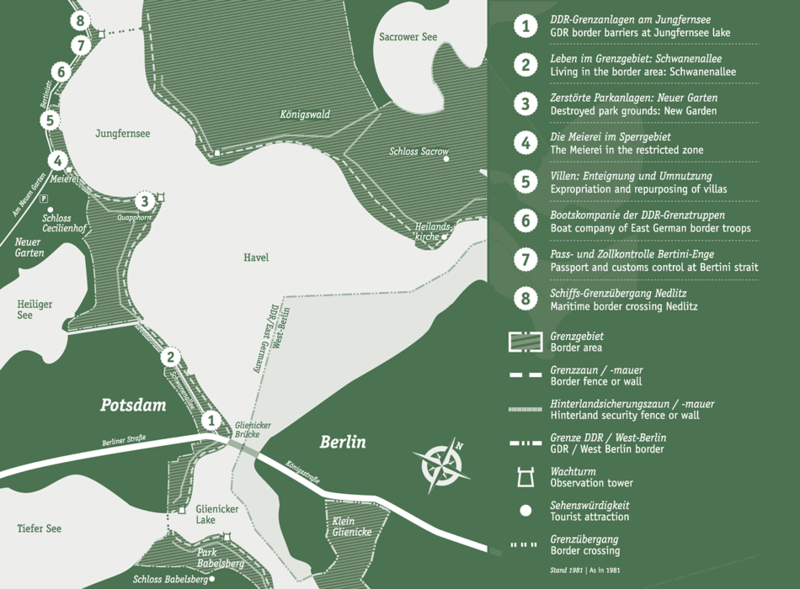 With the erection of the Berlin Wall in 1961, the area along the frontier barriers was declared a border zone. Local residents were vetted by the East German secret police. The frontier barrier cut a wide swath through the New Garden and destroyed the historic park design laid out by landscape architect Peter Joseph Lenné. The ruins of the Meierei were part of the border area as of 1963. No less than eight successful escapes to West Berlin were made from here across Jungfernsee lake. In the early twentieth century, influential bankers and manufacturers bought houses on Bertinistrasse and had them converted into magnificent villas. A boat company of East German border troops was stationed on the grounds of Villa Starck. The company patrolled Jungfernsee lake, the Havel river and Griebnitzsee lake, securing maritime borders. In 1964, a maritime border crossing was set up at Bertini strait. It was responsible for customs clearance and passport inspection of inland waterway transport to and from West Berlin. The Nedlitz border crossing at the Bertini strait was located at one of the most important waterways for inland freight between West and East.